*This game involves using cup points. Can change easily if you don't use cup points. 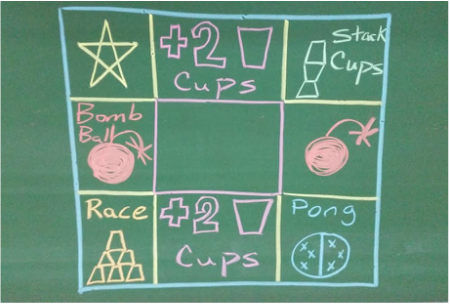 As seen in the picture below, students must race to throw ping pong balls, into their team's cups, from the marked "X" on the floor. If a ball goes into a cup, (Regardless of whose cup it is) the cup is moved to the side of the table. The student to finish all 3 of their cups first is the winner. *The cups are placed back to back in order to make it more fun and fast, with students often shooting balls into the wrong cups. *Scatter atleast 10 ping pong balls on the floor around the classroom. 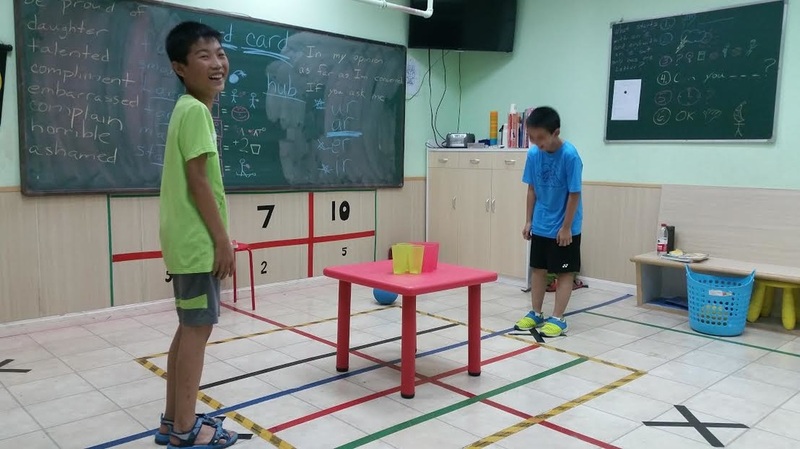 Students race to pick up balls, then return to their "X" to shoot and so on. Younger Students: The cups closest to them are their cups. This makes the game a bit easier because the cups are closer and they don't have to shoot over the other teams cups as the picture shows. Older Students: The cups on the far side are their cups. This makes the game a bit tougher and funnier, as students often shoot the balls into their own cups by accident. *This game needs a bit of setting up, But is definitely worth it!!! All ages have a lot of fun, and with the simple 6 cup set up the games go very fast lasting about 30-45 seconds per game. This allows all students to get their turn to play, each time this game is landed on. Also great inspiration to work hard during class with this game as their reward!!! Stack Cups: This can be played 1 vs 1, or with as many students you like (Need lots of cups). The teacher gives the students their stacking cups and designates how much time is on the clock (20-30 seconds) The students must stack the cups vertically, one on top of the other until the teacher calls to stop after the time has ran out. The student with the highest tower is the winner. Race: This is played 1 vs 1. The students each get 6, or 10 cups. (6 easy, 10 difficult) When the teacher says go, the 2 students must race to stack the cups into a pyramid, Clap their hands, then un-stack their pyramid and clap their hands again. The first student to do this, is the winner. Ball Bomb: *Cup Points Game: Each student gets a chance to throw a ball at the opposite teams cup point pyramid. If any cups are knocked down, that team loses those cups. *Be sure to use a small light ball, and throw at a distance that makes it difficult to knock over the cups. Robin in the Green Shirt is standing on his teams "X" and is shooting for the "Pink Cups" Daniel in the Blue Shirt is standing on his teams "X" and is shooting for the Green/Yellow Cups *They are 12 years old, so to make the game a bit more interesting they are shooting OVER their opponents cups to try and get the balls into their own cups. If they shoot into the wrong cups... owell, they have helped the other team!! !